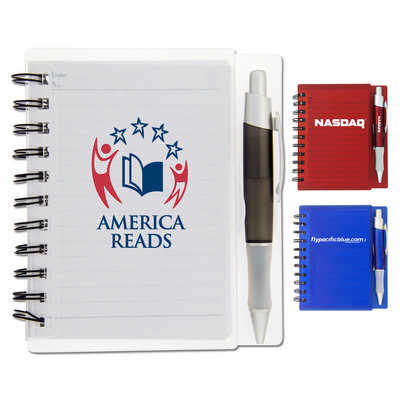 A notepad with rigid translucent plastic covers, spiral bound 90 page notebook and a matching pen with black ink. Add $0.20(G)/pc to imprint on pen and an additional set up of $60.00(G). Colours: Translucent Red with Red?Pen, Translucent Blue with Blue?Pen or Clear with Smoke Pen, Dimension: 140mm w x159mm h. Price includes : 3 Day Service* Screen / Pad Imprint - One Colour/Location. Setup is included.